This entry was posted on november 29, 2014 by HansHB. It was filed under Aktuelt, art, bilde, Blomster, Ein Stück Himmel, Foto, Fotoblogg, Fredda', Høst, Himmelsk, Landskap, Mandarin Orange Monday, MellowYellowMonday, Natur, Nikon, Nikon blog ambassador, Sky Watch Friday, SkyWatch and was tagged with "Hullet i hatten", AF-S Nikkor 70-200mm f/2.8G ED VRII, Coastal Steamer, D4, Ein stück himmel, Finnmarken, foto, fotografi, Fotosafari, fredda', fredda'n, høst, Helgeland, Helgeland - Nordland, Helgelandskysten, Himmelsk, Hurtigruten, Mandarin Orange Monday, Mom, nikkor, Nikon, Nikon D4, Nordland - Norway, Norge, Norway, Norwegian coast, Sky Watch, Sky Watch Friday, The Coastal Steamer, Torghatten. I love this landscape, this great rock has a belly button! Awesome photo! Utrolig bra, Hans! Fin komposisjon og fargen på sjøen er fantastisk. makes me want to climb up and look through that hole! I always love seeing your work…and even though I could see the orange tones straight away … I zoomed in and could even see boathouse.. I assume like the boathouses that feature in the many Nordic fiction books I read. I am reading a (new, for me) Norwegian crime writer at the moment – Jorn Lier Horst . And one day (soon) I will visit your region…with my camera of course! That’s great, – I hope you’ll find Norway interesting! Flott bilde fra Torghatten, Hans… oppi der har jeg vært maaange ganger for et helt «liv» siden, og før kamerainnkjøp… sukk,- Helgelandskysten er bare så flott! What a terrific capture, Hans!! And what an amazing place!! i would love to visit there!! Thanks for sharing! Have a great weekend!! That really a landmark, great photo. Magnificent scenery and a great photo! that is a most intriguing rock formation. Awesome shot. The hole on the rock looks mysterious. What a pretty view, lovely photo. Have a happy weekend! that’s a lovely and interesting view. Wow, a hole in a mountain. Something I have never seen before. 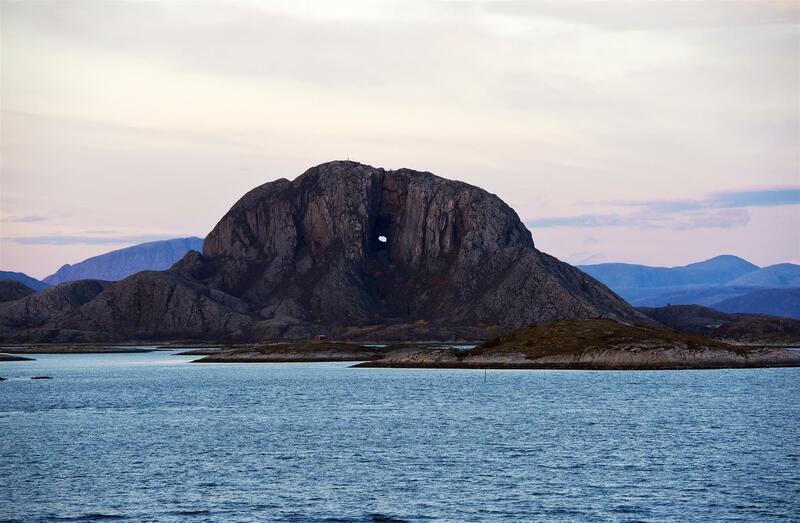 What a great place and shot – that looks like a hole in the middle of the mountain. Hans thank you very much! I have never been there and still it*s a beautiful spot that I immediately recognize. Love the soft tones and the peaceful mood in the image. Now I*ll have a look at Finnmarken! 🙂 Does it belong to Hurtigruten? Love the hole in the hill – myths and legends abound I assume. Hvilket særegent og smukt sted, Hans! Merry Christmas in peace and much love! Wow what a strong and beautiful image Hans. Wishing you a very happy New Year! Great rock and a phantastic photo. This is an amazing scene! Fascinating location! I can imagine a lovely place to wander about.